Seventeen-year-old Anglet Sutonga lives and works as a steeplejack in Bar-Selehm, a sprawling city known for its great towers, spires, and smokestacks – and even greater social disparities across race and class. “With Steeplejack, A.J. Hartley introduces a dynamic, complex and likeable new heroine who combines wits, skill and courage to face deadly challenges in an exotic world. Teens and adults will love this book and want more, more, more!” —Jonathan Maberry, New York Times bestselling author of Rot & Ruin and The Orphan Army. A.J. HARTLEY is the international bestselling author of a dozen novels including several archaeological thrillers, the Darwen Arkwright children's series, the Will Hawthorne fantasy adventures, novels based on Macbeth and Hamlet. 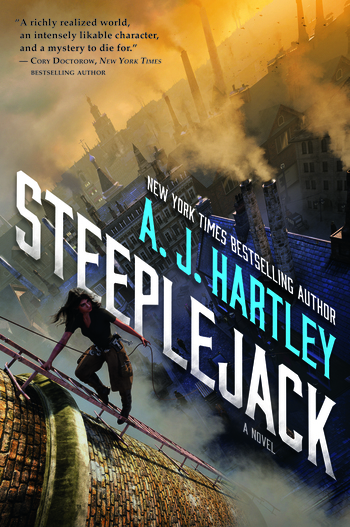 Steeplejack is his first young adult novel. Hartley teaches as the Robinson Distinguished Professor of Shakespeare at UNC Charlotte.